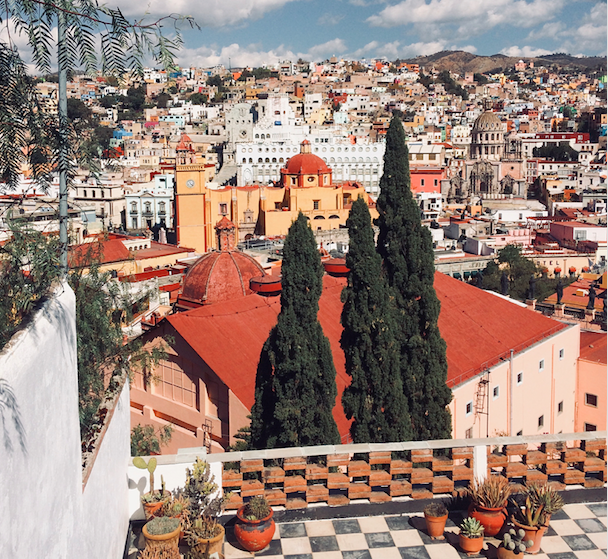 Mexico's the perfect getaway — an easy stop on a cruise, a short flight for a quick weekend vacation, but there is so much more to see in this country. And unless you know what's out there, you'll get stuck visiting the same touristy spots over and over and miss out and what Mexico really has to offer. When I was living in Mexico as a volunteer for the summer, I traveled all over with my friends, seeing as much of the country as possible (believe me, there is way more to see than Cancun or Puerto Vallarta!). With so many rad spots to choose from and adventures to have — not to mention tour companies who are pushing you to just visit the touristy spots — how do you even know where to start? If you want to do Mexico right, you need tips about the best, must-see places that come straight from the real travelers who've seen it all. All my favorite destinations are below! See a World Wonder, wander around crumbling temples, and tour ruins situated above pristine beaches and waving palm trees. While we love the beaches, anyone itching to get a taste of Mexico's expansive and impressive history should stop off at at least one ancient temple or detailed pyramid ... but which spot to you explore for yourself? Found in the thick green jungles near the southern tip of Mexico, visitors who arrive early (around 8:00 AM ) get to explore the slightly remote semi-excavated section of ruins before tour buses arrive. When Europeans first stumbled upon the Palenque Ruins, they thought since Europeans didn't build this impressive and sophisticated complex, aliens must have been the architects. While that rumor has since been debunked, there is something eerily entertaining about an alien civilization hidden in the Yucatan jungle. Huge complex with stunning architecture hidden in the jungle. There is an airport there, but the town of Palenque is rather small and while the ruins are worth seeing if you're nearby, but there are more impressive aspects of Mexico to explore for the traveler on a tight itinerary. Get more on the ruins in Palenque here. Found just outside of Mexico City, come visit Teotihuacan before using Mexico City as a jumping off point to all of your other Mexico Adventures. There are a few main attractions; two large pyramids (the temple of the moon and the temple of the sun, which is the largest pyramid with beautiful views of surrounding mountains). We suggest arriving early if possible and and seeing these two pyramids first before they get too crowded. Time permitting, tour the temple of Quetzalcoatl which is the most sacred and is decorated with stone serpent heads), and the museum if you fancy. We have more details about touring Teotihuacan from Mexico City here. The most famous of Mexico's ruins by far (thanks to its World Wonder status), touring Chichen Itza means having an itinerary that includes the Yucatan Peninsula. Nearby are some of our favorite beaches like Cancun, Tulum and Playa del Carmen (more on those in our section about beaches). This is the spot to see for anyone who wants to pack a lot into their Mexico vacation; in the same area, you can experience the most famous ruin in the country and some of the country's best beaches. Iconic — it's a World Wonder after all! I'd recommend a full day for Chichen Itza; since there is so much to do in the area, you can easily spend about a week or more in the Yucatan if you have the luxury. You can also do it in a shorter time frame if necessary, especially if you're just picking two destinations to visit instead of four. Several organizations provide day trips to Chichen Itza from places like Cancun, but plan on 4+ hours on a bus if you go this route ... we suggest going a less traveled route and seeing a city like Valladolid where you can get a bus ride to Chichen Itza that's about 3 hours shorter than arriving via Cancun. Get more information about touring Chichen Itza (and tips on how to get there) here. "Gorgeous ruins right on the coast" is the biggest perk of Tulum; a popular cruise ship port, tourists flock to the stunning remnants of ancient temples before diving into the nearby waves or sitting under waving palm trees. We've listed Tulum under the ruins and our section on beaches and could even have a whole other section about the underwater caves (cenotes) you can dive into here, so that should tell you how much we love this spot. Which is probably why you're in Mexico, right? You've heard of the touristy spots like Cancun and Puerto Vallarta, but there are so many beaches left unexplored by hordes of tourists that are just stopping off on their cruise. We've outlined our favorite beaches in Mexico below and include some tips to help you plan which beach experience is going to be best for you, whether you're looking for quiet stretches of sand, or waving palm trees that sit in front of rows of resorts. Still need help deciding where to get a good tan and some sandy relaxation? 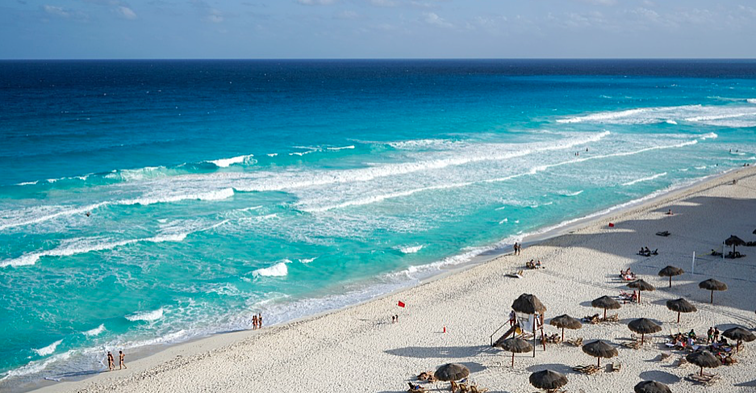 Here's a narrowed down list of Mexico's best beaches. Our advice? Choose a beach that's also near some other bucket list adventure. Mexico is a country bursting with way more to do than just hanging out at the beach. Tulum is a good pick for this — you'll find gorgeous beaches right beneath ancient ruins, plus crystal clear swimming holes hiding in the lush jungles. 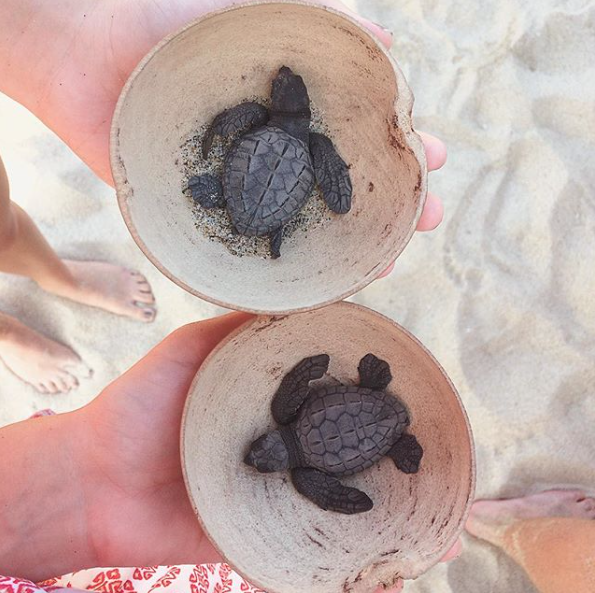 Puerto Escondido is also another good spot; you'll find adventures like releasing baby sea turtles and floating in bioluminescent plankton. If you want to visit a whole stretch if islands and beaches based off of one destination, head to Cancun or Puerto Vallarta. Mexico may be lined with sandy shores, but head inland, and find lush jungles and mountains sporting tumbling waterfalls, turquoise pools, and natural hot springs. You'd miss out on some of Mexico's best hidden gems if you went that route. One of the best adventures in Mexico is diving into the cascading waterfalls. Our spot for experiencing water adventures outside of the beach are found in two places — Agua Azul in Chiapas and the waterfalls in San Luis Potosi. Both are relatively unknown compared to the popular beaches like Cancun or Puerto Vallarta, and in my opinion, I'd take these waterfalls over those beaches any day. Chiapas is found in southern Mexico and boasts the aqua waters of Agua Azul; This spot is close to the Palenque ruins and is also the home of Mexico's Sumidero Canyon. Chiapas is a spot well-suited for the traveler who will be hanging around the southern side of the country. The water in San Luis Potosi has to be seen to be believed. 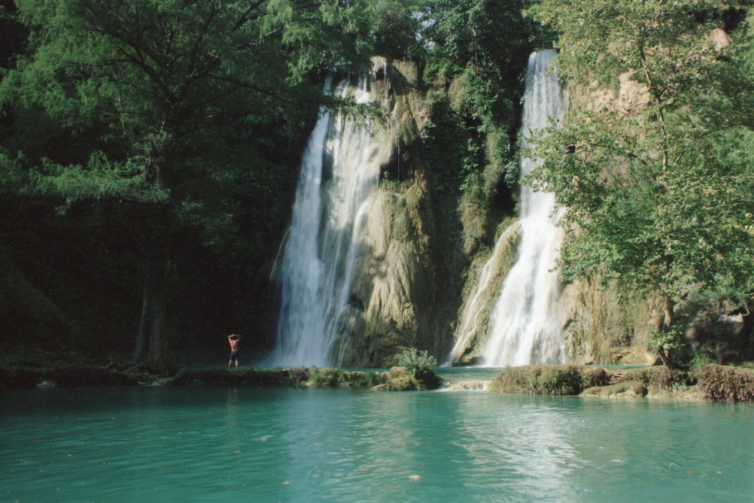 The area is a mecca for waterfall hunting; hire a driver to take you to the various falls and spend a couple of days diving into the creamy blue hues of Huasteca Potosini. This are is also where you'll find the famous Tamul waterfall, a thundering cascade worth taking a boat tour to experience. It's tricky to navigate this area of Mexico but we've put all our tips for a trip to San Luis Potosi here. One of the best weekend trips for our ILP volunteers living nearby are the Grutas de Tolantongo a few hours northwest of Mexico City, You'll find a cascade of 30 naturally heated hot springs, gorgeous turquoise waterfalls you can zip line over, caves to explore, and more. Found deep in a canyon near San Cristobal, this place is an absolute dream. It's not a place you'll find on most itineraries of the quick tourists, but it routinely is one of the highlights for our volunteers during their entire four months living in Mexico..
Get the info you need for a visit these Hidalgo Hot Springs here. The place is a little hard to get to, with unreliable public transport, so you're reliant on hiring a driver or managing a transfer on the official website, but that just adds to the charm. You'll find it busy but not overcrowded thanks to its remote location; we suggest spending at least two days here exploring and soaking in the hot springs. Looking for other spots? Here's our pick of the best places to zip line in Mexico. Time your visit to Mexico right and you can hike deep into the hills of Central Mexico to view the butterfly migration that occurs every year in January to March. First you'll want to head to Morelia, which is the biggest city next to the butterfly reserve (just a couple hours drive from Mexico City). You can also stay in Angangueo; a sleepy little city that’s close to the Sierra Chincua and the El Rosario sanctuaries where you hike in to see the butterflies. If you can't imagine hiking in the mountain surrounded by clouds of orange Monarchs, we have pictures and info about the Monarch migration here. Sounds like heaven? It pretty much is. With so much to do in the coastlines and beaches of Mexico, it's easy to overlook some of the greatest parts this city has to offer: the colorful cities. While there are dozens to visit, we've pulled our go-tos that provide the prettiest architecture, more unique history, and best options for shopping. If you're wanting leather sandals, bags, belts, wallets or anything else, Leon is your city. Called the shoe capital of the world, you'll find a sprawling market full of what you're looking for in Zona Peil. For those less interested in shopping, Leon is a stunning mix of architecture — don't miss the colorfully gothic Templo Expiatorio de la Sagrada Corazón de Jesús church. A gem most tourists miss out is Santiago de Querétaro; feel like you're walking the streets of Spain in this Mexican city. While there is plenty to do (check out times for rodeos) you are going to want to photograph these charming streets all day long. Most alleyways are lined with buildings in creamy yellows and vibrant oranges, plus the city is encircled with towering archways that form an ancient aqueduct that some swear sport a pinkish hue. Take a peek at our go to guide for Querétaro for details on the festivals and events happening here and tips to help you plan your visit. Photograph the Parroquia de San Miguel Arcangel in the morning, afternoon, and evening and get a cathedral that changes colors. You can also see the city via hot air balloon rather than on foot if you'd prefer, or take an even slower pace and soak in the hot spring resort found in the surrounding hills. If you'll be in the state of Guanajuato, San Miguel Allende gives you a quaint glimpse into a colorfully picturesque city. 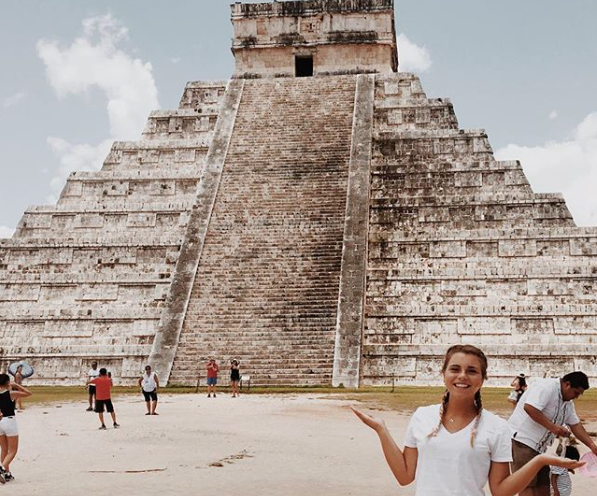 Whether you're in Mexico for a week on a quick vacation or for a semester teaching English, these are the things that will help give you the authentic experience you're looking for. Want to experience the real Mexico? We are a non-profit org that works with schools in Mexico. Our volunteers spend a semester living there together, experiencing the culture, serving the local kids and their families, and traveling all over the country! If you'd like to receive more information about volunteering in Mexico (or any of our other locations all over the world), drop your information below. One of our representatives who has volunteered before will text you to chat about your questions.